I had an exciting opportunity to witness 1300 of New York City's finest, students that is, attend a special performance of Hamilton. It was my second time at the show. But this was NOT the same show I saw before. This was experience like no other. They are not throwing away their shot to rise up in the room where it happened. 1300 New York City public school students attended an exclusive matinee performance of the show with hottest ticket in America. Thanks to partnership between Hamilton, The Rockefeller Foundation, the Gilder Lehrman Institute and the NYC Department of Education, another lot of students from New York's Five Boroughs were granted an invitation to Hamilton. That is after they successfully completed and passed their curriculum pertaining to the subject. A true stage to page experience. The smash hit phenomenon has reached global success to the point that it has not only opened up eyes to a new audience but it is truly a profound teaching tool. Unless you've been living under a rock, you know the musical, written by Lin-Manuel Miranda, was at the center of some recent controversy when Vice President elect Mike Pence made a recent visit to the show. With a speech aimed to education, Brandon Victor Dixon, who plays Aaron Burr, spoke on behalf of the ensemble in hopes of starting an important discussion. In some arenas, namely social media, it backfired, but the message Dixon relayed is the rich message found with Miranda’s piece. This is a story of old America told by today's America. Prior to the performance, a select few students got to make their "Broadway debut" by performing original work on the Richard Rodgers stage. At the core of their pieces was a narrative inspired by Hamilton and other pertinent information integrated from their studies. From poetry to song to dance to spoken word, these select students found their moments to shine in front of the biggest audience they could dream of. Associate choreographer Stephanie Klemons served as MC and hype girl, getting the students geared up to watch their classmates and peers. Some of the many highlights included a scene inspired by Abigail Adams written and performed by Kiara Leon and Anda Rosca from East Side Community School, some profound words in a scene from Jaelen Smith and Adante Power of Repertory Compay High School for Theatre Arts, a lyrical dance from Keturah Stephen, Liliana Delossantos, and Destiny Trevino, of Brooklyn High School of the Arts, and the pure vocals of Juan Mateo Garcia of Brooklyn Theatre Arts High School. All of this was set up by the incredible poem entitled “Let’s Make America Great Again” delivered with fervor and passion from Amell Garrison of Achievement First University Prep High School. 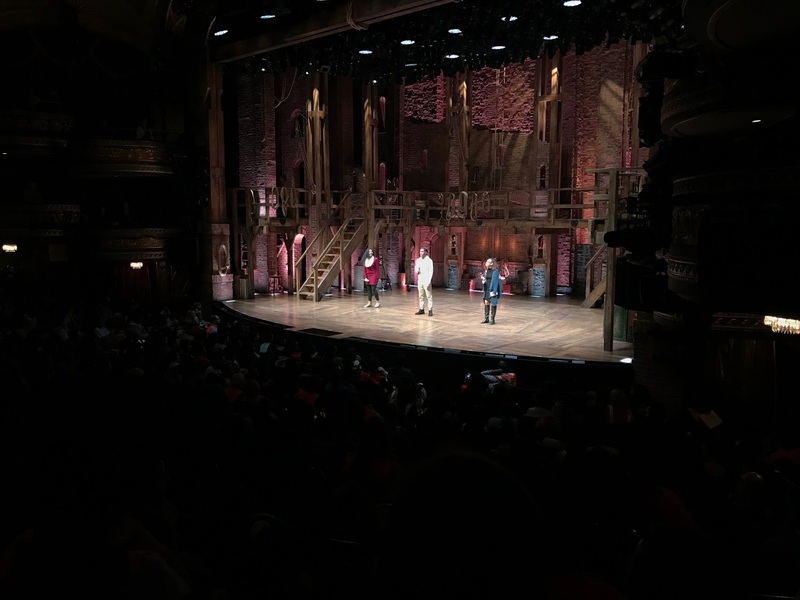 If being able to see the show wasn't enough, the students got to listen to a very special question and answer session featuring some of the stars of Hamilton. Sharing their time and knowledge were Sasha Hollinger, Rory O’Malley, Eliza Ohman, Sydnee Winters and star of the future, and overall fan favorite Jordan Fisher. From silky, frothy questions to deep, personal statements, the wealth of insight the cast shared resonated. If you looked around closely, there was not a phone in sight. These kids were listening and engaged. If you're one of the lucky few that has scored a ticket to Hamilton, you know what it's like to be in that audience. Even if you've seen a Broadway show, you know the etiquette. Those rules don't apply here. In fact, Stephanie Klemons ASKED this crowd to vocalize and react. Throw them out because these kids have no fear and will respond. The room was electric. The energy they gave the company was immediately given right back. And wouldn't you believe the moment the lights came up for curtain call everyone was on their feet. The Richard Rodgers was electric. Even glancing over at the great ushers, they were energized by the aura from the students. It's an experience you can only have in this room with these students. They reacted to everything, good, bad, or indifferent, proving just how in-tune they were to the words of Lin-Manuel Miranda. What this great partnership has afforded the youth of New York is integral to our future. Art truly does have the power to change the world. What these students took from their day at the theater is yet to be scene but what is certain, this is a field trip these kids will never forget.